I am going to show using Xdebug with Docker. 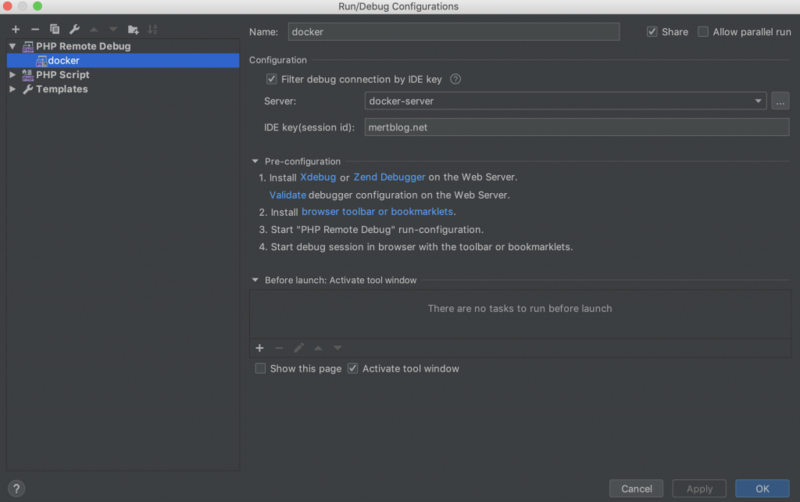 Because, as long as you prefer using Xdebug on development workspace with Docker, you have to create remote connection of the Xdebug. First of all, you must have a Xdebug client. I would rather use PhpStorm for this. With this way, I am going to mention some hints and ways to use smoothly. Let’s start! I would like to start a Symfony project which is running on Docker. I will tell this independent from Symfony. Through Docker Compose helps me about it. My structure is like as the following. Well, I share my Docker assets. Here you are. This is php.ini file. And third one is the Dockerfile. The important points are on here. If you haven’t got Mac OS, you’re supposed to change xdebug.remote_hostas your machine IP. In addition to this, as you see, my idekey is mertblog.net and my remote_port is 9001. You are able to change it. Finally, let me show docker-compose.yml file. 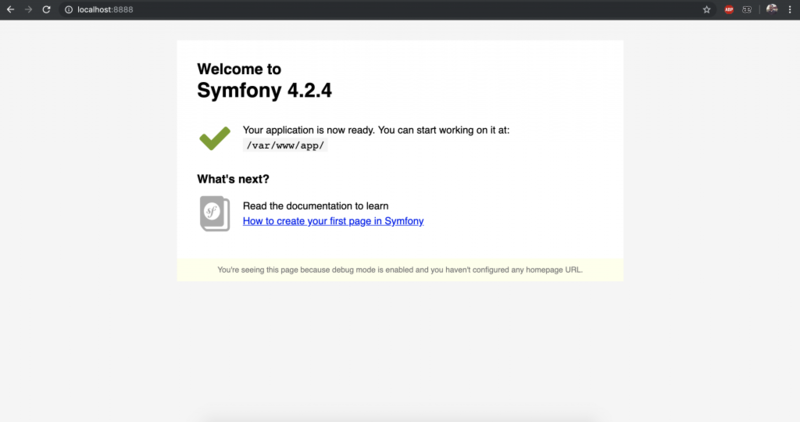 I installed the Symfony application which I’ve refered this document. I started my web application by using this command. From now on, I could configure the Xdebug client. For this, follow this path from the interface. 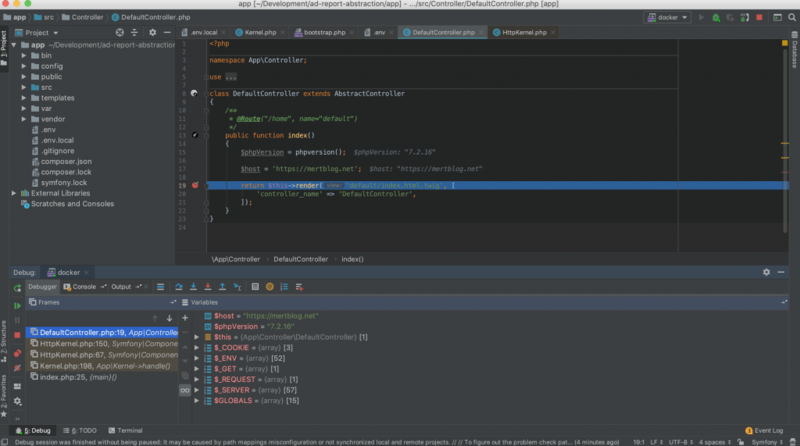 Phpstorm > Preferences > PHP > Debug. You are going to see Xdebug Debug Port. You should change as 9001 port. 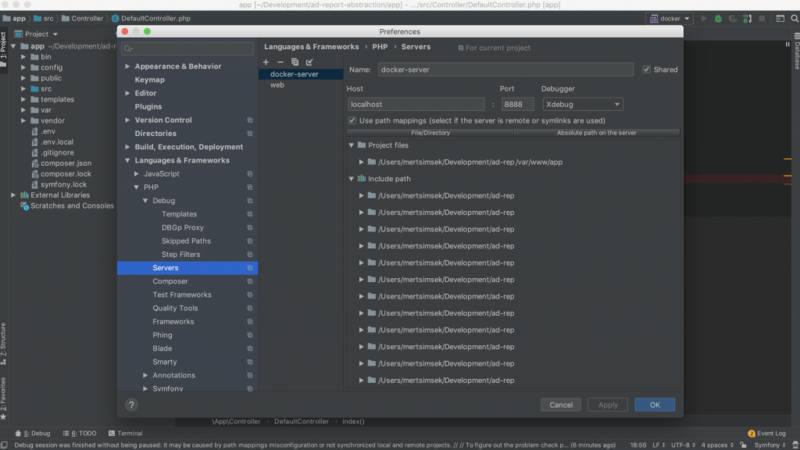 After that, follow this path Phpstorm > Preferences > PHP > Servers. You are going to see this screen. I’ve set the name docker-server. My host is localhost and my web server post is 8888. Click the Use path mappings. You have to define the Absolute path on the server as /var/www/app. It links to our project directory on the local machine. Well, after this, you close this screen and click the Edit Configurations section on the left side. On this section, we are going to create a configuration under to PHP Remote Debug. I’ve set the name as docker. My server is docker-server which I’ve created just before. And Ide Key is same thing in the Dockerfile. I clicked the phone icon to start listening PHP Debug Connections. I’ve put red point on the 19th line. From now on, I am able to debug my variables on PHPStorm interface obviously. It truly helps us and with this way we could notice mistakes easily.